The Chessmen are currently on tour, in a joint exhibition organised by National Museums Scotland and the British Museum. They spend the summer of 2010 in Edinburgh and will travel subsequently to Aberdeen, Shetland and Stornoway, opening there in April 2011. 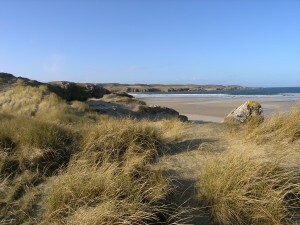 We expect some will pay a brief visit to Uig. The Uig or Lewis Chessmen were found in 1831 in a stone cist in the shifting dunes of Uig Bay at Ardroil, by Malcolm “Sprot” Macleod of the village of Pennydonald. The pieces are elaborately carved in walrus tusk and stand between 3.5cm and 10.2cm high. We know of 78 pieces, comprising eight kings, eight queens, sixteen bishops, fifteen knights, twelve warders and nineteen pawns, suggesting there were eight sets. All wear a glum expression and four of the warders are seen biting the tops of their shields. These are berserkers, the fierce Viking warriors who worked themselves into a frenzy before heading into battle without armour. From the style of carving and dress, the pieces have been dated to the mid to late twelfth century and are certainly Norse in origin. They may have been produced by one or several workshops in Trondheim, Norway, where a similar piece was unearthed. Accompanying the chessmen in their stone chamber were fourteen plain round gaming pieces and a carved belt-buckle. How the hoard came to be in the sandbank is, of course, unknown. Norse occupation of the Western Isles lasted for nearly five centuries and the chessmen may have been hidden towards the end of our Viking period. A local story maintains however that they were brought ashore much later by a young shipwrecked sailor, who made the mistake of telling a gillie he met in the hills what he was carrying. The unscrupulous gillie murdered the boy for the pieces, which he naturally hid, but he was himself hanged in Stornoway for other crimes and allegedly confessed to the murder on the gallows. Years later, Malcolm Macleod came upon the hoard of chessmen by chance. Rev Col AJ Mackenzie and a friend came across the bones of a boy in a cave in the hills and supposed they must have belonged to the young sailor. It seems the pieces were initially displayed by Malcolm in his byre and people came from around the district to view them. He sold them, apparently for £30, to a Roderick Pirie of Stornoway. (Malcolm and his family and neighbours were evicted from Pennydonald a few years later when the farm at Ardroil was created.) The chessmen were exhibited to the Society of Antiquities of Scotland in Edinburgh and passed to a dealer. The British Museum bought 82 pieces, believing that to be the whole set, but ten were sold privately to a member of the Society who also bought a stray bishop directly from Lewis. These eleven were acquired for the National Museum of Scotland in 1888. Six of the chessmen were last in Uig in 2000, for a single day. Two large wooden chessmen were recently commissioned from Stephen Hayward, Tain, by Uig Community Council, and now stand outside the museum and near the findspot on the machair at Ardroil. Update: a scholarly article published in Mediaeval Archaeology in November 2009 (see press reports) suggests that the findspot may have been Mealista, rather than Ardroil. Uig disagrees. The article does provide valuable background information, however. See the chessmen at the National Museum of Scotland and at the British Museum. Our posts about Vikings; and books about the chessmen. 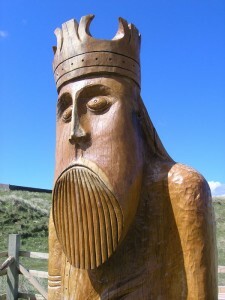 The video was made by Keith Stringer and shows the installation of the King (recently named Jorund at the 2008 Gala Day) at Ardroil.